Sleepovers are an exciting invitation in your child’s social development. 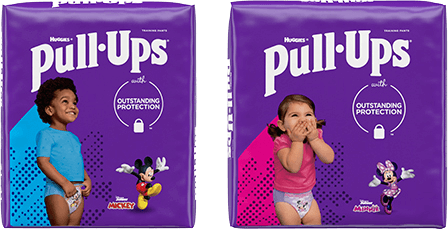 If your child is invited to a sleepover and is concerned about wetting the bed, no worries, you can have them wear Pull-Ups® Night*Time training pants. If your child is over 4 years old have them wear GoodNites® NightTime Underwear. Children this age often want privacy, so these stealthy underwear-like garments help her stay confident at sleepovers. Discuss the process with your child in advance: where her nightime training pants will be packed, how she can change in privacy and arrangements for disposing of wet training pants in the morning. Some parents quietly work out an arrangement with the host parent in advance for disposal. An additional option is to bring a zip-top plastic bag and stash their discards in the bag in their overnight bag for disposal later at home. Whatever makes your child more comfortable is fine.